As part of my pledge to be Creative Every Day, my first post is about a party I hosted. 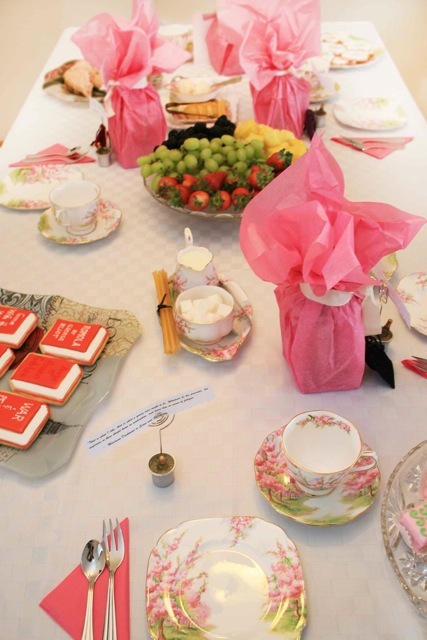 Not just any party, a Jane Austen Tea Party! This wasn’t the first tea party I’ve had. Two years ago I invited my closest girlfriends over and we sat around drinking tea, eating yummy treats while having a good chinwag. This year I decided to try something a bit different. There was still tea and yummy treats, but I also decided to set the dining room table, play classical music and put together a little goody bag for each friend. 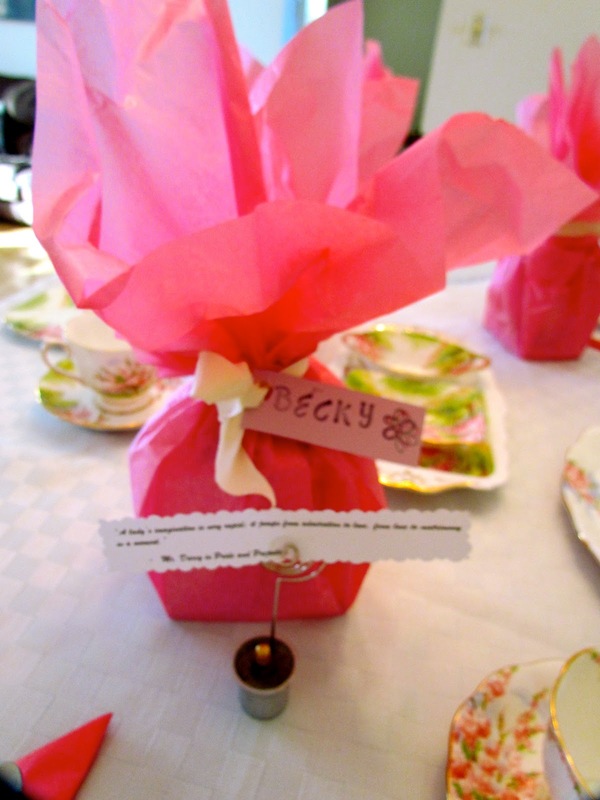 The gifts were tea cups, a notepad and a gemstone. While the gifts were the same in essence, they were also different. Each gift was chosen specifically for their personalities and their interests. 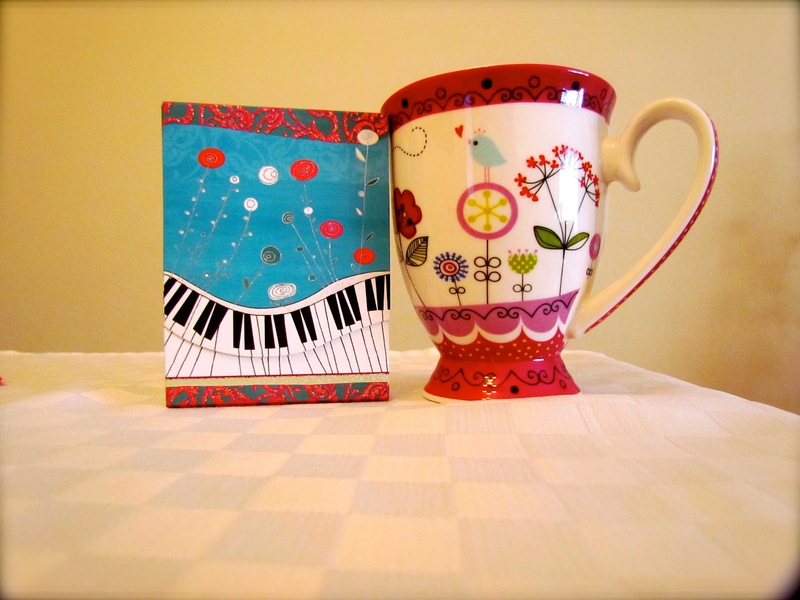 This tea cup and notepad was for my friend Becky. She loves music and the colour pink. Once I selected the gifts I wanted to wrap them up all pretty. I found some tissue paper and ribbon in my scrapbooking supplies. I keep every spare piece of ribbon I find, sometimes they pay off! For name tags, I used light purple card stock and stamped their names in black. It was a personal touch and fun to do! To decorate the table, I printed out various quotes from Jane Austen’s books and placed them in a photo stand, in front of the gift. It was fun searching through quotes and using funky scissors to cut them out. 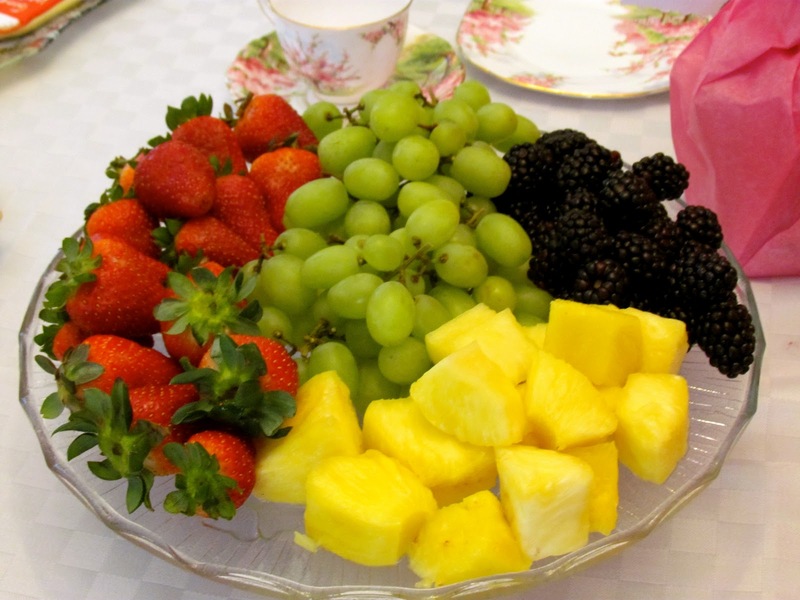 What about the yummy food? Well, I splurged and custom ordered cookies to match my china set. 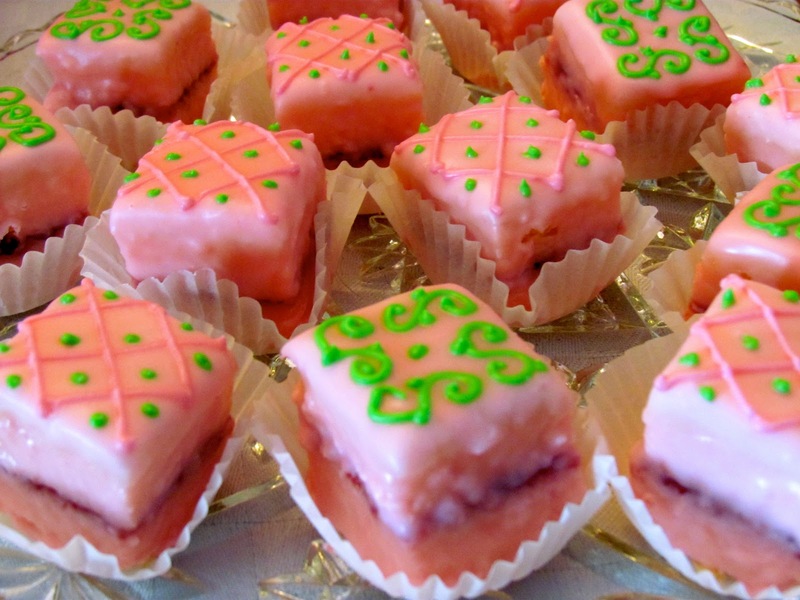 I also served petit fours, fruit and scones. Okay so that’s gifts, table settings, music and food, but what about the tea? Instead of selecting one tea for all of us to drink, I gave the girls their choice. 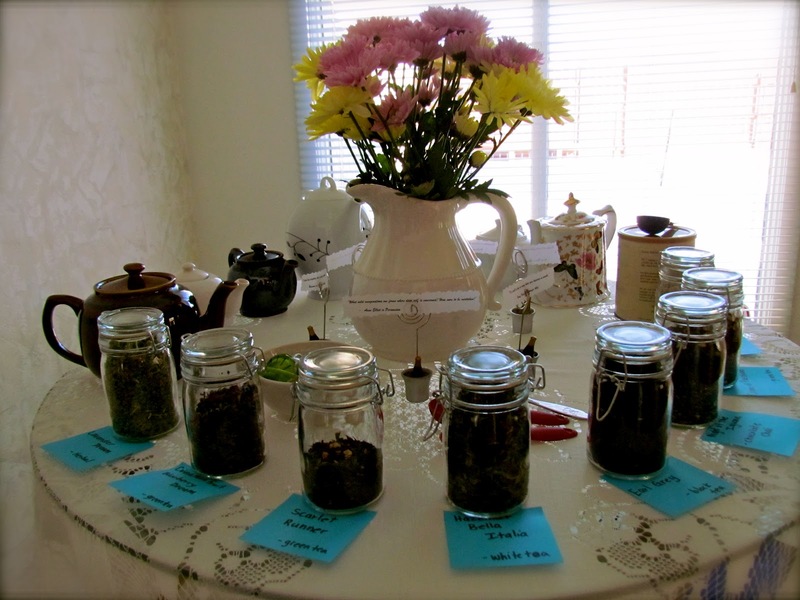 I set up my kitchen table with multiple teapots and 8 varieties of loose leaf tea, even some hot chocolate for a friend who doesn’t drink tea. The flowers on the table helped us forget that outside it was blustery and cold. All in all the party was a success! We had some great laughs and even better conversations. I think it helped bring out all of our creative sides! What a fantastic party! So creative, so colorful, so much fun! How lovely and extremely civilized! I'm sure your friends appreciated all the care that went into making it special for them. Well done you! How creative! Looks like a fantastic party with yummy treats 🙂 Awesome!!! Thanks for the lovely comments Carolyn, Jo-Anne and Lillie! Next time I'm coming to your house for the tea party. I don't care what the plane fare costs. I DO have a passport after all….! 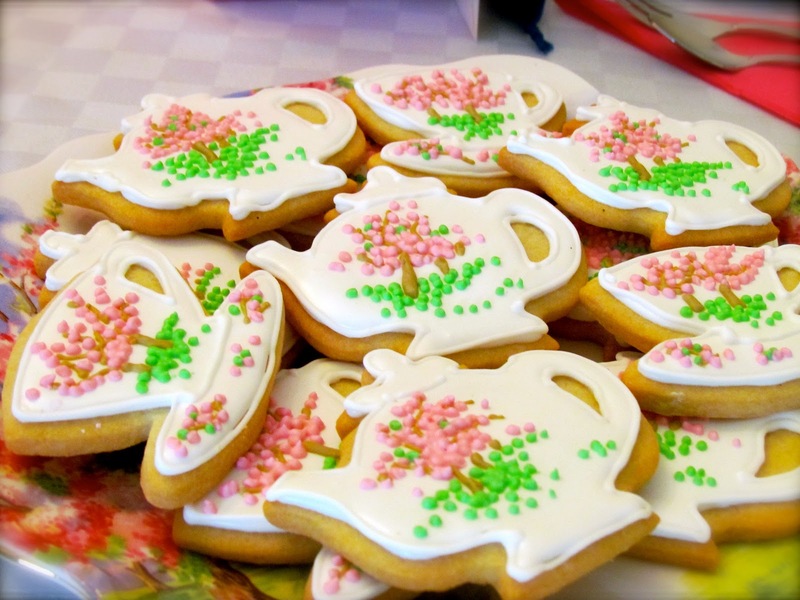 !Besides, those teapot cookies are entirely too awesome. And a long "chinwag" about books and writing would be entirely divine. Lovely idea! I pinned one of the pics for inspiration! As one of the fortunate guests I can vouch for the fact that the tea party was absolutely fantastic! The decorations were so creative, the gifts thoughtful, and the tea and treats refreshing and delicious. When did you say the next one is Angie? Consider this my R.S.V.P! !